Today, the NYC Department of Education released its 2010-11 progress reports for high schools. (See our breakdown of the K-8 progress reports.) 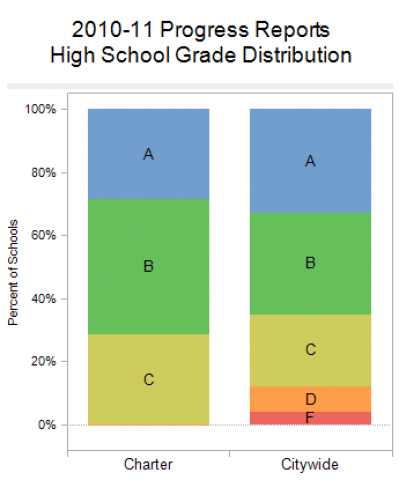 The reports assign a letter grade to each school, based on student test scores, student progress, attendance, and “learning environment” survey results—all heavily weighted to account for differing student characteristics. There were 21 charter schools with high school grades in 2010-11, representing 17% of all charter schools that year. Of those 21, only seven received a progress report this year, including only two affiliated with a network. The rest have yet to reach 12th grade, which means many of the progress report factors (e.g. graduate rates) aren’t available. Among those not receiving grades are charters affiliated with Uncommon Schools, KIPP, Achievement First, and Democracy Prep. Charter high schools’ overall grades were 2 A’s, 3 B’s, and 2 C’s. That’s a slightly lower percentage of A's than in the city as a whole (29% vs. 33%). Click on the images below to use the interactive charts. There is an important addition to this year’s Progress Reports data: the introduction of three measures of college preparation. (Gotham Schools has more details.) These "phase-in" metrics will not affect letter grades until next year. 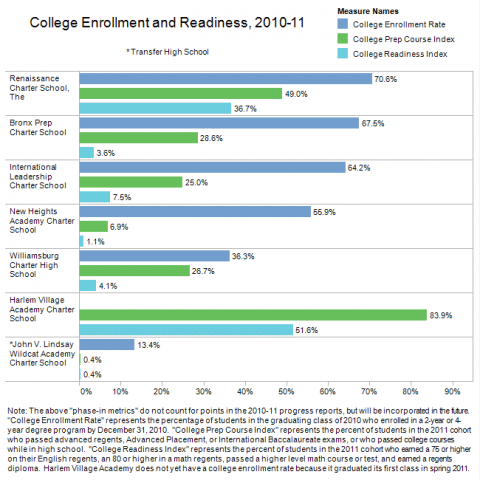 While the sample is small, the college prep statistics are sobering for these charter schools. There's much work still left to do.